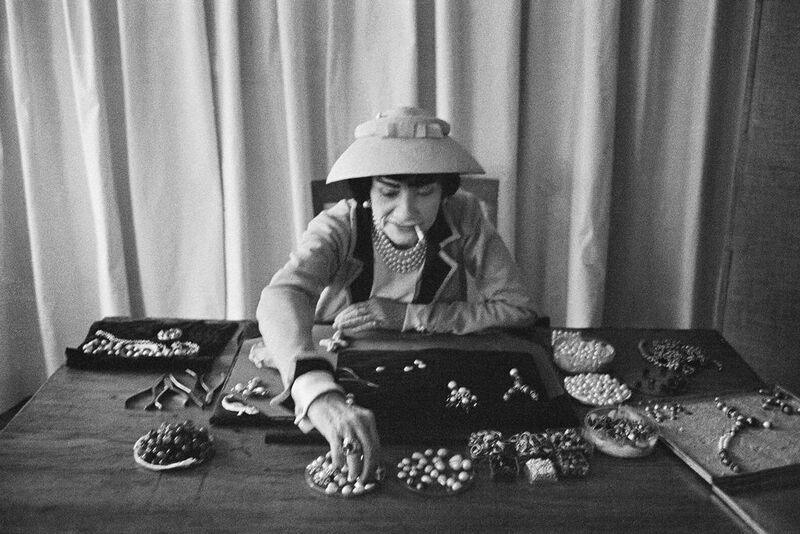 Size: * 11x17" 24x36" 17x22" 44"
Article number: MS Coco with Jewellery-B&W-44"
Coco Chanel creates jewellry in her workroom. She works with plasticine surrounded by boxes overflowing with "jewels." Mark Shaw's informal, grainy, black and white images of Coco Chanel were created using an unobtrusive 35mm camera and film processing methods that enabled him to eliminate all other photographic equipment. Although Shaw's techniques increased the grain and contrast of the photographs, the lack of intimidating, distracting flash and lights allowed him to capture an unusually relaxed Chanel. The source for this image was a vintage 35mm black and white negative. The approximate printed size of the image in inches will be 10” x 15” (11” x 17” paper size), 13.75” x 20” (17” x 22” paper size), or 22” x 32” (24” x 36” paper size.) Note: Sizes are approximate since some images have been cropped in keeping with Mark Shaw’s original vintage prints of this material. Mark Shaw is best known for his photographs of Jacqueline and John F. Kennedy, which he shot originally for LIFE magazine and later as the Kennedys’ “unofficial” family photographer. He developed a strong friendship with JFK and Jackie and regularly visited the White House during their time there. But Mark Shaw was first and foremost a Fashion and Advertising photographer whose freelance assignments for LIFE magazine had him photographing some of the most notable celebrities of the 1950′s. All Mark Shaw prints are made to order in limited editions on Hahnemϋhle photo rag paper. Each print is Estate stamped on the back and signed and numbered by David Shaw, and accompanied by a letter of authenticity. Lead time is four to six weeks, but sometimes sooner. *Please note this image is available in 3 sizes. Prices increase as editions sell out.